Screentime, a controversial subject, like most in parenting. TV or no TV, iPhone or no iPhone, tech or no tech. So what is the truth behind AAP’s statement? What ARE we supposed to do and what does the research show? SO WHAT DOES LEXI USE? I looked into it extensively when Lexi was born, made a decision and adjusted things as we went and based on our daughter’s changing personality and needs. Here’ s a detailed breakdown of what I know, what we do, how we do it and why. We have not used a TV set for years now. We sold our TV 2 years ago and we hadn’t watched it for more than 5 years prior to that. Why we had it, I am not sure…. Not watching TV was a mutual decision. I saw no point in wasting time watching out of order shows, and depressing news, or vapid reality series. I was one of the early adopters of Netflix and it just made no sense to us to have to wait for an episode of a favorite show every week, or a movie with commercial interruptions. So we’d Netflix disk after disk of 24 and How I met your mother and Big Bang Theory and That 70s show and every other well done entertaining series that we could find and watch it in our “movie theater” room on a huge movie screen on the wall with an HD projector. It was our own mini- movie theater. We loved it! That was our relaxation time after a day of hard work. It really was amazing. Then Lexi was born and out of literally 15 of our favorite must-see shows, we had to downsize to only one, Vampire Diaries (I couldn’t resist Damon!). I always wanted to share Disney characters, favorite animated movies with her but knew that it would be a while before we would do it. I am NOT against media and screentime, I love entertainment and think it has a place in everyone’s life. I love video games and can’t wait until she is old enough to play Mario Brothers with me, or Baulder’s Gate, a role playing game that we used to stay up till 4 am playing with Andrew, or play fun Wii games, or Rockband. I can’t wait until we can do all that together. It’s a part of being a child- being able to do fun things like playing video games and watching hours of favorite shows ( obviously when she’s MUCH MUCH older). I did all those things as a kid and it was awesome. I loved it! It brought so much joy and I hope that she can experience that too some day. But at the same time, with television and video games, as a kid, I also read a ton, was a straight A student and still had time to be on several sports teams, clubs and hang out with friends. It was a good balance. So, no, I am definitely not against screentime, I think it enriches our life. But just like anything it needs to be balanced and age appropriate. Which brings me to my initial strategy when it comes to Alexis’ use of media. After reading countless books about it with studies cited and information pointing in the same direction, I had initially decided to NOT have Alexis watch TV/movies till she was 2 years old and hopefully 3. That decision did not necessarily extend to other media usage, like Iphones or computers. I hadn’t thought about those at that point. I was a bit naive by thinking that I could keep Lexi away from all screens for 3 years. Though, I am still hopeful that we will not make a habit of watching movies or cartoons even past 2 years of age. After a while, I was adjusting my ideas and thoughts and I am finally at the point where I think I am the most comfortable at and I’ll explain why a few paragraphs down. AAP recommends no media usage for children under the age of 2, and I think they then go on to say, that 3 would be an even better age (or maybe that was one of the book authors I read). Their primary reasoning for that is lack of parenting interaction. When a parent sits their child in front of some sort of screen, rarely is it done in order to interact with the child. Usually it’s a form of pacifier, babysitter and a toy in one. Since babies learn BEST by interacting with humans, it would be counterproductive to their development to sit them down in front of the TV/tablet/iphone at an early age, because 1.) they wouldn’t understand much of what’s going on on the screen hence zero learning, 2.) they will be missing out on the valuable interaction with their parents. What AAP fails to mention, unfortunately, is that not ALL screentime is the same. That the biggest reason to avoid screentime for a child under 2 isn’t the parental interaction and that every family situation is different. That there are SOME type of screentime that are OK or even, dare I say, beneficial, and that some kids get more parental interaction than even necessary. And that the TRUE danger of screentime before the age of two has nothing to do with parental interaction. Life is hard, all kids are different, some are harder to entertain and keep entertained than others, and some parents are single moms or dads, or have their spouse work long hours, and responsibilities need to be met and dinners cooked, so I get it. For some parents, it’s simply not an option NOT to sit a kid in front of the TV while they cook dinner. If you’re a stay at home mom, the child hopefully gets plenty of parental interaction during the day that 30-60 minutes of screentime use isn’t going to do anything, because they get literally 13-15 (at least in our case) hours of uninterrupted mommy or daddy time, full of educational play and fun moments and reading and outside time and baby classes and a zillion other opportunities to learn. I mean I get why AAP has a blanket statement about media usage like that. If you say you can’t do something at all, without explaining the nuances, you give a lot less of a wiggle room for people to break those rules. It’s much better to say “NO TV till 2“, than “No TV till two unless…“. Because people will jump on that “unless” and they will abuse it, they will out-think it or they will justify not following it. “It will be fine!” “I had my kids watch TV and they are fine!” We call it MKAF in our circle of mommy friends ( MY KIDS ARE FINE!). So it’s easier to say “No TV till 2!” Period. No more discussion. I personally don’t like rules. I don’t like being told what not to do without a good solid explanation that I will then probably challenge anyways. So after reading more material on media usage, I came up with something else, a better plan for our family. *Note: these are my personal findings and derivative ideas that are fit for me, and my family. Your actions might vary from ours when exposed to the same information. 1. There is no such thing as educational TV before age 2. Children under 2 learn through human interaction only. Some of it is true! Most of the time, by putting your child under 2 in front of some app or movie or show that claims to be educational, you’re simply losing a valuable opportunity for learning. Some companies have had to remove any educational claims from DVDs targeted at under 2 year old, after they got sued. Most under two year olds are just not old enough to understand what’s going on on the screen in a way to make it beneficial, like learn words. Caveat: This I was not ready for. I kept thinking no movies are educational, no apps that claim so are educational. Not until 2. I allowed Lexi to use the Iphone apps because it was fun for her, she got to see beautiful animals, hear their names and sounds or read e-books with me and it just didn’t seem harmful. What didn’t even enter my mind, or these authors making theses claims failed to mention is that…drumroll… SOME children develop enough mental capacity before age 2 TO be able to learn something from a show or a movie or an app and apply to it to real life. I am sure many mothers can attest to that. When Lexi , at the age of 18 months, suddenly learned both Russian and English alphabet, former solely from and latter with the help of the iPhone, when she started making dance moves and acting out her favorite songs and knowing all these words we never taught her, I realized that a blanket statement like this should be adjusted by parents themselves based on individual child’s capabilities, interests and needs. Two years of age isn’t a magic number. Some kids are ready before two, others still get nothing educational from media way past 2. It’s been a consistent key to everything on my motherhood journey. All kids are different. That being said, there is ANOTHER BIGGER BADDER reason not to expose kids to TV/movies till age of 2, and this reason is the only reason that I find worth considering. 2. Fast Scene switching present in all adult TV and most children’s TV predisposes a still developing and growing brain of a baby to ADHD and a few other similar issues. For most parents and in most family situations this one is THE MAIN reason to hold of till 2 or more, not the parental interaction, not the lack of learning. THIS! The worst things for them is the ADULT programming. Notice how freaking fast all adult shows and TV programming are switching frames. It’s to keep our interest. And it keeps our baby‘s interest, but it’s also doing a lot of harm. If you’d like your child to have screentime while you get stuff done or for entertainment or even for possible learning ( note, I say possible, since every child is different and becomes able to learn from passive screentime at different rates, select shows that are most life like or apps that have either no scene switching, slow scene switching or controlled scene switching ( needs to have a button press to move onto the next scene/page). Home movies starring your toddler help with memory and recollection of events. Shows, like the old “Mr Roger’s neighborhood”, not only have a slow pace but he uses a child directed speech which helps comprehension. Now if you ask me, that show is boring as hell. So what are the other alternatives? I found that WORD WORLD and Daniel Tiger’s Neighborhood ( spin off of Mr Roger’s neighborhood) have the slowest switching scenes of most modern shows. Mother Goose Club is really good, too, if you skip the animated parts of the episode, and the episodes are based on word rhymes which help with language development. Studies show that Sesame Street is more educational than other popular shows like Barney ( that one is the worst of them all) if watched after your child turns 2. It does have a lot of scene switching so we’ve been staying away from it for the most part. If possible, watch the shows with your child first and explain to him/her what is going on so that he was able to learn more from the show. Or better yet, skip the cartoons and shows and movies all together and use e-books, music and iPhone apps that help your child learn more than cartoons give them. For app recommendations, check out BEST TODDLER APPS post. What about Video games? Believe it or not, the right kinds of video games have shown to be beneficial to the child’s focusing ability, social interaction ( if it’s a multi-player game) and multitasking (age appropriate, of course). So that’s a surprising finding that I am sure many teenagers wish they knew about so that they would tell their parents to get off their back about video game playing. The key to this is playing games where fast reaction speed, focus and multitasking are the key. By playing these games, our children basically practice these skills. Of course, anything that contains graphic violence is inappropriate. So while there are both studies that show negative effects and beneficial effects of screentime on children, the key to remember is what determines whether your child will benefit from screentime is YOU. Your knowledge, the types of games and media you allow your child to use and the balance between their social life, creative time, outdoor time and media usage. I will not cite studies I mentioned here. It’s not my job to do that. I am simply sharing what I know and believe in. It’s up to you to either take my word for it, or go and do your own research. We all want what’s best for our KIDS. If you’d like to read more on screentime effects, these three books have chapters dedicated to media usages and are great books to read regardless. Here is what we are doing right now and as always it’s subject to adjustments as Lexi grows and we learn more as parents and see how things work out based on the current screentime strategy. 1. No actual TV watching ever. Most shows and movies to be watched with a parent narrating it, at least for the first time. That way not only will I know what Alexis is watching, but I can explain more complicated moments. I can get a movie that I know does not contain any violent scenes, or sends the wrong message. As sad as it is to admit to myself, but I will not feel comfortable showing most of Disney shows to Lexi for a while, because I am not exactly happy with the level of violence, deaths, negative emotions, envy in them and the message they send to a small child. Once Alexis is MUCH MUCH older, it would be better since at later age they are able to discern what is real and what is not. But right now, even seemingly peaceful good-hearted stories like Pocahontas have a strong element of violence and anger in them. It’s important to watch a movie with your child, because you can better explain what’s going on which will enhance their comprehension and what they get out of the movie. When it comes to watching movies, if the parent is involved in the movie watching , it actually benefits their language development rather than hinder it. 3. No fast scene switching. One of the first and most important rules I established when we started introducing Lexi to media (or more like when she introduced herself to it). All the screentime that she does have absolutely CANNOT have fast scene switching. She gets the iPhone(which is all she uses at this time) in short spurts. Sometimes when she asks for it, sometimes when I need to do something and she won’t sit still. She’s always had a container hate, it’s been consistent since day 1, so it’s extremely difficult to go to restaurants or stores with her, because all she wants to do is go explore, not sit in a high chair or cart. She has no older siblings to entertain her, and books only take her so far since she can’t actually read them. Bringing sticker books and crayons has been helpful but again they only give us 10-15 minutes max before she sees something she wants to go run play with. I wouldn’t expect an adult to sit still, bored, looking around at random things, even though they have the self-control to do. I wouldn’t want to do it myself, so I don’t make her do it. I think that’s fair to take into accounts physical and emotional limitations of toddlers. So in situations like that, if she wants the iPhone, she gets the iPhone until the food arrives or we are done shopping. 5. Any app has to be interactive and have an element of education. Books are best, then come educational songs/videos, then educational games and quizzes. Everything that she comes in contact with has taught her something aside from just giving her joy and exposure to animals, environment, and objects she would otherwise never encounter in real life or know about. It hasn’t been long since I have come to terms with iPhone usage. Our first reaction as humans when introduced to new things is avoidance and fear (which is quite ironic because change is the only constant in our lives), but the truth is this is 2013, kids are born into the world of media. They will simply know how to use it, like using it, be attracted to it no matter what we do ( save for the last effort of ditching all the iphones/tablets in our house). So I decided to embrace the use of technology as something inevitable and actually beneficial rather than run scared from it, simply because “that’s not how we were raised“. Because I see the joy, I see the results in our particular household and that’s good enough for me. The key, for me, is control over what she does on media and moderation (see rules above). Otherwise, I treat it as a normal source of knowledge and entertainment, no less beneficial than books and toys. So what does Lexi use? What do I consider worth her time both for entertainment and educational use? E-books! Lots and lots of e-books. Lexi has always been a book worm. From birth. And that love extended to e-books. Lexi absolutely loves her Dr Seuss books, her Little critter books, Potty book and some Disney story books, Russian books, and interactive books. Alphabet apps: Russian alphabet apps that she loves, with alphabet games and quizzes built in, English alphabet songs. Nursery rhymes: Apps of popular nursery rhymes. Mothergoose club: The only real show she watches at the moment. It has great rhyming throughout the story, fun characters, beautiful songs and dances, rhyming word usage. At this point she is getting ready tired of it as she knows every song so well and dances to each using the moves the characters use, so I am trying to switch her over to WORD WORLD, which also has slow scene switching and lots of spelling and word usage. If she is watching something, she might as well be learning in the meantime. 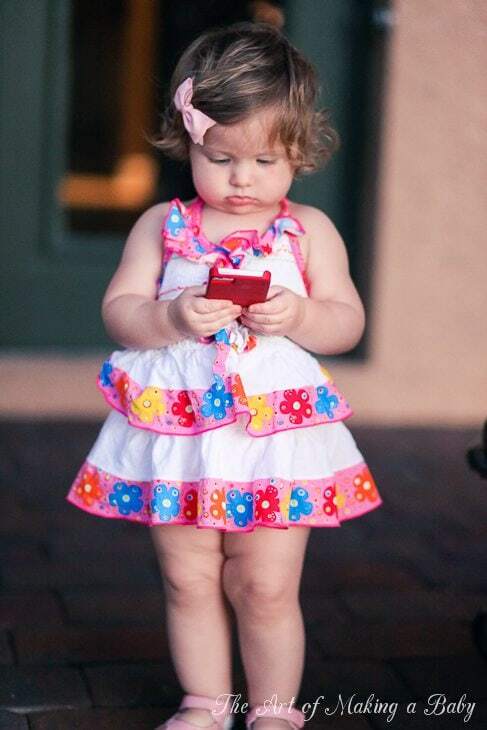 When we first introduced the phone to her, we were still iffy on whether we should be allowing her to play with it. As a result, we tried to restrict when and how much she uses it. As one would expect, it backfired (the more you tell them they can’t have it, the more they want it). She would beg for it and throw “mini- tantrums” (not really actually tantrums, but the closest we’ve come to it). That kind of behavior made me even more worried about allowing her screentime. I thought that she became too obsessed about it. It was only after I realized the benefit of the iPhone and made some rules for what she is allowed to do on it (and deleted what she isn’t, like Youtube, any video apps), and I let her use it whenever she wished like any other toy, that things calmed down. She started treating it like any other toy after a few days and would play with it for a few minutes before moving onto something else. I also stopped carrying around so often. Out of sight, out of mind. She stopped being obsessed. 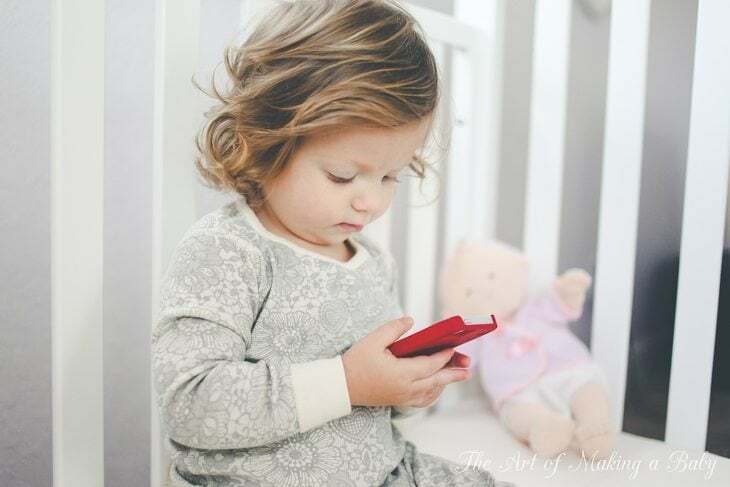 She will still ask for it when she feels like she wants to sit down and read a book or look at the animals, but there is almost never any tears connected with the iphone unless she is very tired. If I need it for a minute, I nicely and persuasively ask to hand it over to me so that I could do “this one thing/call this one person” and tell her that I would give it RIGHT back to her. The key here has been to not undermine her trust and really give it back to her. She hands it back to me without any issues, and waits till I am done. If she was really into what she was doing, I have to repeat “Just one more second sweetie” and she continues waiting ( the key is to look kind and convincing). I nicely ask her if we could give the phone to the birdies because they really want to play with it, too. (now that she knows birdies like it, all I have t say is “Honey, birdies want the iPhone!”) She looks at me intently each time, considering how birdies feel right now and then slowly and gently hands me the phone and watches me “fake-throw” it to the birdies. This works when the battery dies and I tell her that we now need to give it to the birdies so that they could charge it. Now she often gives me the phone when she is done with it and signs “BIRD” so that I would give it to the birdies. Or if the phone isn’t around she will sign “All gone” and “Bird” indicating that the birdies have it when the most adorable earnest look on her face. The key to this is to explain it to them several times using very convincing words and expressions while looking in their eyes, be kind and detailed and use words that they understand and possibly signs. Keep being gentle and kind explaining it until they stop crying for the first time, then you simply need to continue giving a shorter explanation every time you take it away and throw it to the birds. After a few days, all that’s necessary is to just ask them if “you could give the phone to the birdies”. I am sure other animals will work just as well. Before this system, we would have to warn her it’s her last few minutes on the iphone and simply take it away which, understandably, would really upset her. Ugh! I hate this part. Wi-Fi, cell phones, laptops, PlayStation…. All of these emit waves. Little is known about the effects of those waves. There have been studies about the effects of cell phone radiation on people and they are worrisome. We can’t get away from it, though. We have two wi-fi routers in the house (a main one and an extender), we have cell phones, we have laptops… it’s crazy. when handing her the phone, keep it on airplane mode only. When I was pregnant, you might remember that I used a Belly band and a blanket that protect your unborn baby from cell phone/laptop radiation. I so wish I could just wrap little Lexi up in a shielding blanket and never let go. Or bury my head in the sand and refuse to acknowledge it as a danger, which is very tempting. I can’t. What I did do is looked into cell phone cases that help with re-directing and blocking waves. The red cell phone case in all my cell phone pictures is by Pong Research and it works to redirect radiation away from your head and body. They sent me an Iphone 5 case to play with and I’ve been using it religiously since I read the facts about radiation and how their cases work. Obviously, the closer your IPhone is located to your body, the more harmful the waves are. The case redirects as much as 90% of the radiation waves away from your head and body, so when you’re talking or even carrying it in your pocket, you are not exposed to the full range of waves. Once redirected, they are much further away from any human to cause an issue. FCC has set a limit to the amount of radiation that cell phones are allowed to emit to 1.6 W/kg. IPhones are below that limit at 1.19 W/kg and with the Pong case on, that number goes down to 0.42 W/kg. Obviously, for babies and toddlers who don’t have the body mass to compare to an adult, it’s still important to put a phone on airplane mode, but the Pong case at least helps with the majority of radiation that cell phones emit. The case doesn’t interfere with reception, quite the opposite it boosts it. Pong Research has cases for all popular devices, including iPads, Androids and Blackberries and you can buy them on Amazon or directly from Pong. Before anyone goes thinking skeptical thoughts, read this independent testing article by WIRED magazine. My goodness that dark hair on Lexi is stunning. I always pictured her as a blonde, but she is rocking that brunette look! I can sense your hesitation/going-back-and-forth on media, as most parents are in the same situation. Nothing confusing: no tv (running programmin) watchin, we don’t watch, she doesn’t either. Some show watching after two is/was my plan, but it doesn’t mean that i am strictly adhering to it without EVER breaking the rules ( I am against sweets and salt for babies, but I will still give her a bit of a cookie or ice cream or my salty food if I feel like it. Same here). She watched maybe 2 episodes of word world, the rest is mostly mothergoose club for their songs and dances. The age two came from recommendations anyways, based on when babies start learning from passive media and as I found out we’re beyond that already. That makes sense- breaking the rules every now and then. It just sounded like you were adamant about no “tv” screen time, but then mentioned she did have “tv” screen time. What is your opinion about the ipad? Will Lexi be getting one soon? I wondered if the bigger screen is better for babies/toddlers because they don’t have to squint, or worse because of the bright lights and motion would be more in their face? There is still no TV screen time. 🙂 Hopefully never will be. I’m all for an ipad. I am waiting for an upgrade to the mini and then getting one. I do think the bigger screen will be better and since we don’t really do a lot of flash/fast motion kind of apps, I am not concerned with the effects. That being said, she has never used one so I don’t know if she would possibly prefer a smaller iphone to the big and bulky ipad. I couldn’t help but chuckle at your “she doesn’t have older siblings to occupy her” comment. People used to always tell me when I was pregnant with twins, “oh it will be so nice, they can entertain each other.” Yeah, okay, not so much. If anything my kids antagonize each other more than anything lol. Of course they can entertain each other too and play nicely but it’s not that cut an dry. I still refuse to pacify them with technology. It’s against our values. This is such a tricky subject but you seem to be doing so well! I have friends whose kids never watch TV, the TV is in the attic! I wish that we could be like that, but I do find myself using the TV to “babysit” my almost-3-year-old so that I can get other things done. She likes a variety of different shows, some that I do approve of, some that I abhor. We do like the Leapfrog shows and she’ll often be singing the songs “The B goes Bbbb, the Be goes bbb…”. We were at the YMCA and I saw something on one of their signs that said that the average child is in front of some sort of screen for 7 hours a day and only outside 4 minutes a day. If that is true, it is both sad and crazy! I have never allowed my kiddos to use my iphone just because its mine and I refuse to share it! Yep, yep, and yep! 😉 Totally with ya on this one, Elena. The only thing different in how we approach it is that I do allow an occasional episode of Max & Ruby on the iPhone (the frame rates are slower than most cartoons from what I can tell), and we haven’t permitted too many apps yet (save for the FP ones). Mostly, DD loves to use the iPhone to look at pictures and videos of herself (narcissist! hehe). However, we still do struggle with transitions. I don’t want to say that “X” wants the phone, because that’s not entirely truthful and we are committed to being as truthful as possible (but framed in a way a toddler can understand). I’ve tried front-loading that I will be taking it away in X time, then doing a count to 5 and taking it then. That method works so well for other life transitions, including bedtime, but is not always effective when it comes to handing off the iPhone. So we are practicing the “out of sight, out of mind” policy most of the time. 1) Blue light (the type of light cast by iPhones etc) disrupts sleep patterns. The effects of this are pronounced when the screen is held close to the eyes. 2) CVS- computer vision syndrome. This is just a fancy word for eye strain, which is especially a problem in young children with developing eyes. Again, this is worsened with small screens held close. 3) I see no benefit to my son learning to read or whatever at age two. He will have plenty of time to learn academics. Studies have even shown that while there is no long term advantage to learning to read before age five, children who do learn to read before age five have higher levels of anxiety and are less likely to read for pleasure. Current recommendations are to actually slow down precocious children so that they learn about the world of things before delving into the world of words. I would love to hear some of your favorite iphone apps for babies! My lo is 15 months and loves watching baby videos on my phone for a few minutes at a time but she always puts her finger on the screen, wanting to move or do something to the characters herself. I know she would love some interactive apps. Thanks! Also, I have ibooks that I use myself. Is that what you use for her to read books on? The link I posted has the e-books designed specially for children. Hi Elena, I was going to ask for your source on the link between television and a predisposition to ADD/ADHD, because that’s a very interesting one to me. But I noticed your disclaimer, so I went ahead and did some research on my own — thanks for the gentle prod, as we parents should try to base our beliefs on unbiased research as much as possible. In case your readership is interested in what I found, I’ll share it: I couldn’t find any scientific literature definitively linking TV watching in very young children with ADD/ADHD beyond one isolated case study, Christakis et. al, which was published in the April 2004 issue of Pediatrics. At the time it caused a big uproar and has been sourced exhaustively. But the study was met with a lot of criticism about the methodology used by its authors. People have pointed out that the children’s mothers were self-reporting results, which might have been unintentionally biased or faulty, or have confused correlation with causation. It was also pointed out that young children who have inherited ADD/ADHD from a parent often become obsessed with and even benefit from watching TV, because it’s an activity that allows them to focus for long periods of time. Kids with ADD/ADHD have often inherited it from a parent, and that parents who themselves have focus problems are more likely to allow a hyperactive kid to mellow out in front of the TV, creating something of a “chicken vs. egg” scenario when it comes to trying to figure out which came first, the TV or the focusing problems. One other interesting tidbit from all that research — one study (Swing et. al, published in the July 2010 issue of Pediatrics) made a strong case for a link between TV and attention span problems in preadolescents — but it made the same claim for video games, too! My personal conclusion based on that research: parking your baby in front of a TV for hours a day obviously isn’t a great idea for a number of reasons, but the ADD/ADHD link is pretty shaky and not one I’m going to stress over. Love this! Good to know and thanks for posting. I wish i had the time to dig up the links to the studies I’ve read about to compare to this. Our daughter, Bella, is about a month younger than Lexi, and my hubby and I have been struggling with how best to raise our child in the age of iphones too. For now we’ve decided to hold off on all media, but who knows how we’ll feel as Bella gets older. Our situation is maybe a little bit different from yours, because Bella doesn’t really mind sitting in her stroller and in a highchair at restaurants. If she had a harder time sitting still, we might have to re-evaluate our current anti-media policy. The important thing, like you said, is that everyone has to make choices that work for their families. I love the picture of you and Lexi snuggling with the iphone on the sofa. My hubby posted a super-similar picture (he has a daddy blog, which I think is the cutest thing ever) of Bella and me reading a book on our sofa. Cutie patootie toddlers for the win! And I can’t wait to hear about your trip to Disney! Bella’s going through a huge princess phase right now (guess which one’s her favorite!) and talks about princesses ALL. THE. TIME. I’d love to be able to take her to Disney soon, but it’s far away for us and costs a ton of money. But to hear her chatter away to her favorite princess totally would be worth it. Have fun!!! Not any more :0 It’s hard to be into football when your team keeps losing (Browns) and free time is so sparse that weekends are more valuable than gold. I do miss following sports teams, though. That’s the only thing I miss about TV: hockey and soccer used to be a big part of my life. Great informative article! Thanks a lot for writing it. I have a 7 months old baby, and she is fascinated by my iPad, and the apps in it. When I was pregnant I said no TV, no iPhone, no iPad near my baby! But, oh how things have changed! I’ve learned to compromise a little, in moderation. We don’t watch TV, though, that’s the only thing I’ve kept her away from. Great post! We saved one of our old iphones when we upgrade to the iphone 5 to let my almost 2.5 yr old play with. He only gets it as a last resort at a restaurant if we’ve blown through the stickers, coloring books, etc and he is not having it. It has no 3G capability and is only hooked up to wifi and he only plays with educational apps. I truly believe that moderation is key and educational apps are important. He loves video touch and sound touch apps as well as the Fisher Price Puppy ones. P.S. Your Pong amazon link is broken! I am surprised that you allow her to use it with all the studies linking cell phones and brain cancer I am even weary of using phones and microwaves, etc. for myself. Having a tv can be great for raising trilingual children though. My son is 6 now but I never let him use any electronics at his age and even now it is very controlled never over an hour a day. I am checking out pong now that sounds great. My son is speaking two languages so Dora in Arabic helped him so much and when he was around 2 he would start speaking Arabic well just from things he picked up from it. You could even get Russian cartoon channel to help her. And the the larger screen and her being far from it is much better than up close on a small phone. OOps sorry I meant to say bilingual for you all. My son is learning 3 languages in private school. I’m a little late in posting but this is a really fantastic article and one that is really hitting home with my little guy. He just turned 14 months last week and we’ve started allowing certain iPad apps, that are educational. We’ve also permitted him to watch 1 or 2 cartoon’s on PBS, I think one was Bob the Builder and the other was Word World. Both times, my husband and I both sat with him and watched. Personally, I do not use TV as a means to entertain him so I can do something else, but as a way for us all to bond. We cuddle, talk about what’s going on, on screen and then relate it to books or other toys he has. I think you have a fantastic lay out for what works for your family and seeing how you work it helps me because I am always looking for tips and pointers from moms going through similar situations. PS: Lexi is such a beautiful girl! Thank you for this! I’ve been feeling guilty lately about my son’s media usage. Being a SAHM with a husband who works and goes to school full-time, I find myself alone with my son A LOT. I love being with him, but he has always been a little high needs. I love meeting these needs, but I have some of my own. When he was younger, the only way I could get a shower in was if I waited for my husband to come home (HA!) or if I occupied my son in some way…that way was with the TV. Was I proud of the fact that an episode of Yo Gabba Gabba was the only way I could distract him long enough to shower? No, but it worked when NOTHING (bouncers, swings, etc) else worked. I was always quick about it and only did this every few days, but I have felt guilty from time to time. Now it is a daily show that he gets in the morning as I “wake up” and get to brush my teeth, pee, check the email, pay a bill, etc. Then it’s on to just me and him for the rest of the day doing activities and such. I let go of some of the guilt when I realized that the show actually was teaching him a little something. He also occasionally gets to watch a sign language video which I hated at first since I figured sharing my language with him was enough, but he just wasn’t signing anything back. Every once in a while I pop on the video and THEN he starts signing a new word. I think seeing other babies and toddlers signing, encourages him to use it. We also now use the iPhone mainly in the car as he HATES car rides. I do use all my other “tricks” first before the phone, which only has to get pulled out if the trip is longer than 15-20 minutes. Either way, I think you’re so right. You have to evaluate your situation, and decide what is best for your child and recognize is if it has some actual value. You post has brought some peace to my mind about how I’ve decided to parent my son. It’s not my proudest moment, but you’re right…30 minutes a day is only 2% of his whole day, and I fill the rest with plenty of moments rich with learning opportunities. I respect your approach to things and LOVE reading your blog. Always inspirational. Thank you for this post, which was written very eloquently. Save for a letter recognition app/game (little spellers), a sports game my husband has on in the background of daily activities, and an occasional movie at his cousin’s house, my 7 & 3 year olds don’t watch TV often or have exposure to much media. When I tell my friends this (if they ask), they gasp. If you break down our daily schedules, time doesn’t allow for it. Most days, my boys eat breakfast at the breakfast bar while I pack their lunches, and we talk about what we are looking forward to that day, by the time we are done with breakfast, they get themselves dressed, brush their teeth and we leave to drop 7 year old at bus stop. My 3 year old goes to pre-school while I work part-time from 9 am – 3 pm. (No screens at pre-school.) We are home in time (3:45) to get my 7 year old off the bus. Our afternoons/evenings consist of homework (3 year old colors or cuts paper while 7 year old works), dinner, then 4 nights a week, the 7 YO has either soccer or baseball practice, each is 2 hours. During practice my husband & I play at the fields with the 3 year old. By the time we get home, it’s 7:45, enough time for pajamas, teeth, a quick story and bedtime. Our weekend down-time (around our sports commitments) is spent playing legos primarily, playing in the backyard, going for scooter/bike rides or doing arts and crafts. Kids are in bed by 8:00 and from 8-9 I pick up the house and get the laundry done…then at 9:00 I become a slave to my DVR and I LOVE it! 🙂 But having said all this, I wonder when children of working moms even have TIME to watch TV! I get that not all kids play 2 sports like our older son, but even if he didn’t, the kids still would need some sort of activity. Kids naturally need to RUN! (Clarification: Our 7 year old LOVES playing Wii, so some days, he wakes up earlier than every one else in the house just to get 30 minutes of his hockey/baseball/golf games in! It’s the only time he’s allowed to play.) I cant’ speak for SAHMs, but for us working moms, who has time for TV! ?